All we need from a host community is a space to hold the popup and help to spread the word. We’ll do the rest! You will benefit from brand exposure in our digital marketing campaigns. We will gain a space to educate small business owners. “I enjoyed the popup and got a lot of useful information that I plan to follow up with. Great idea to help small business on Vancouver Island. You should consider hosting them in more communities! – Tina Short, attendee of Nanaimo Popup. “Great to meet the SBBC team today! Lots of awesome information shared” – Cyndi Knill, SBBC Popup attendee. “This program is good for new small business owner, any information provided is always very helpful, I am glad there is a place where we can go to keep us track on what we need to do “checklist” provided by Gary is very helpful” – Nila Roxas, SBBC Popup attendee. “Thank you for arranging the pop-up in New West. I found it very helpful and Gary was very resourceful” – Rachel Luu, SBBC Popup Attendee. “Good afternoon Amy and Dylan, Just wanted to thank you both for coming out to Ladner and hosting the Pop-Up last Thursday. It is wonderful that you are able to come out to our smaller communities and allow business people to learn of all the amazing resources available to them through your office. I hope that it was a successful Pop-Up for you. 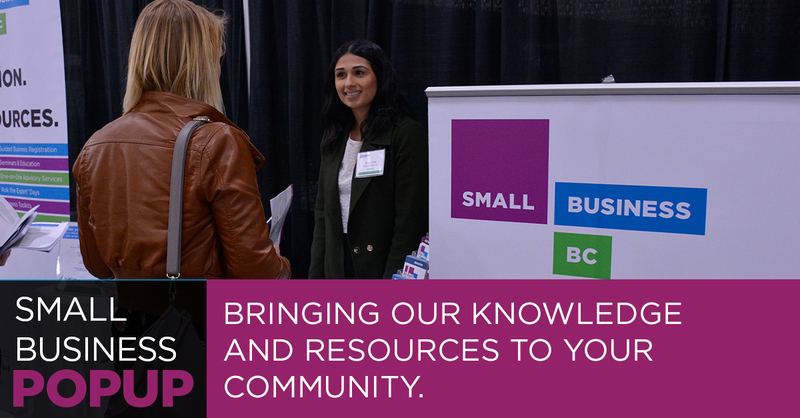 Thank you again for bringing Small Business BC to Ladner!” – Kathy Dance, Ladner Business Association. “Jayme was very helpful. A worthwhile program!” – Susan Nielsen, SBBC Popup Attendee.